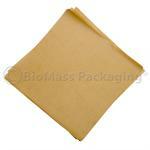 Great for wrapping sandwiches and foods for frozen storage, this unbleached, polycoated natural kraft wrap is grease-proof, chlorine-free, microwave and freezer-safe. Great for packing and wrapping sandwiches, cookies, bagels and snacks, our unbleached, natural kraft bags and wrap are chlorine-free, grease resistant, and 100% compostable. NatureFlex cellulose-based wrap is made from renewable, plant-based resources, not petroleum. This clear sandwich wrap is 100% compostable, suitable for both hot and cold food, and great for sandwiches, baked goods and confectionery.